A Bookcase filled with several books. The Bookcase is block added by BiblioCraft that displays books. When right-clicked, it presents the user with an interface showing the books which are currently stored in the bookcase, as well as the inventory. By default the bookcase can't hold books that have not been written yet (can be changed in the mod config file), it will however keep books from other mods as well, such as a Linking Book or Printed Book. If you place a Redstone Book in the bookcase it will cause the bookcase to emit a redstone signal whose strength is dependant on which slot you put it in. Bookcases also work with vanilla enchanting tables. Every 8 books placed in the bookcase is the equivalent of 1 vanilla bookshelf block. So a full bookcase is equal to 2 vanilla bookshelf blocks. The books do not have to be on the same shelf or even in the same bookcase, every book is counted. 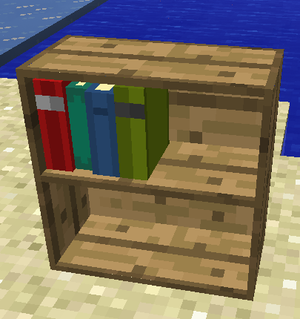 The BiblioCraft config file contains a number of keywords which will control what sort of items the bookcase will accept; the mod then searches for any item with that name and adds it to the bookcase's white-list. If you do find that a book-like item from another mod does not fit into the bookcase, you can modify this list accordingly. This page was last modified on 19 May 2016, at 13:55.